This was one of those little hikes that was really a pleasant surprise. It was a hot Sunday. All the prime trailheads were going to be packed with cars. We wanted to just find a nice little trail with a good swimming hole and find a way to stay cool while exploring a little new territory. The East Branch Gorge Trail is located on Route 8 between Wells and Bakers Mill. 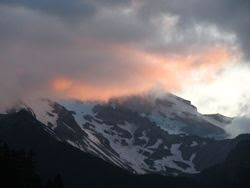 It is just south of the trailhead at Eleventh Mountain that leads to Siamese Ponds. We had never been on this trail before. 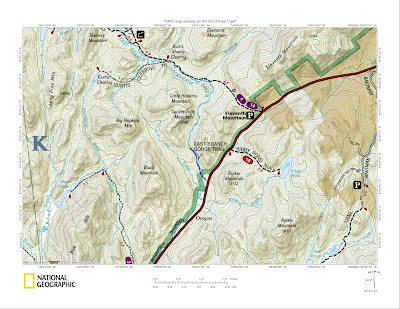 It is shown as a herd path on the National Geographic map. 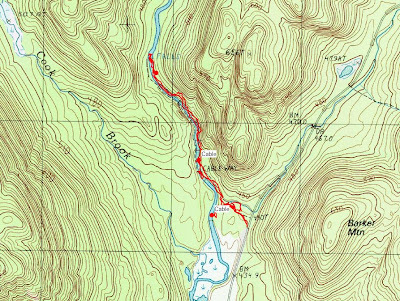 The topo map labeled a "Cableway" and "Falls". The cableway especially piqued my curiosity. I wanted to see what that was. We thought we would walk to the falls and also look for a place to swim. There is a huge pulloff on the north side of Route 8. Nothing is labeled. A jeep road heads into the woods a few yards east of the large pulloff. It looks like people have driven in the first short distance to a clearing where there is an illegal firering. After that, large rocks block the way and the herd path starts. It is not marked with discs, but it is obvious. Almost immediately you have to rock hop a small tributary. After you cross, you go a couple hundred yards to a cairn on the right, marking a turn in the trail. If you miss it (like we did) you will end up at the waters edge and will see a long single cable crossing slightly downstream. We backtracked and found the herd path. The herd path follows the south side of the East Branch. We followed the path a ways to where the topo map had labeled "cableway". There we found evidence of former cable marks on a tree. We kept going so we could see the falls. After a few minutes we came to a new cable location. The cables look fairly new. They are close together, making it feel uneasy to walk on. If I had some nice gloves with me, I might have tried crossing all the way. Does anybody know the history of these different cable crossings in this area? I'd be curious to know more about them. It seems like it would be easier if the upper cable was higher. Just downstream from the falls we found our nice swimming hole and stopped to swim and have lunch. Great spot. Refreshed, we looked at the falls before going back. The entire trip was only 3.2 miles and took us 2.5 hours including our lunch and swim stop. I'd say check it out if you are passing through, especially on a hot day. The herd path was nice to walk on, unlike many of the overused marked trails. Our route. Note the cable locations. 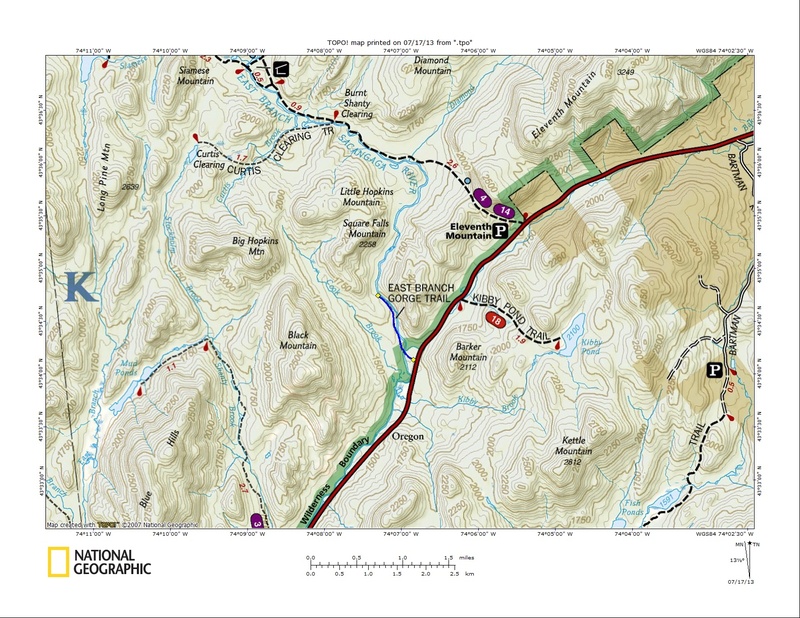 National Geographic map of the trail. Thanks for the info. It's all very interesting. It looks like you brought your dog with you...did you get your dog across the cables? Or find another way across the river.? I just climbed on the cables to check them out. We didn't cross the river. Thanks for this info! This was a very cool, secluded hike. It took me a while to find it even with your good instructions, here are a few more clues. The huge parking area is 11.4 miles from the route 8 split from route 30 in Wells on your left. When you pull in and park facing weeds, the trail is all the way to your right. 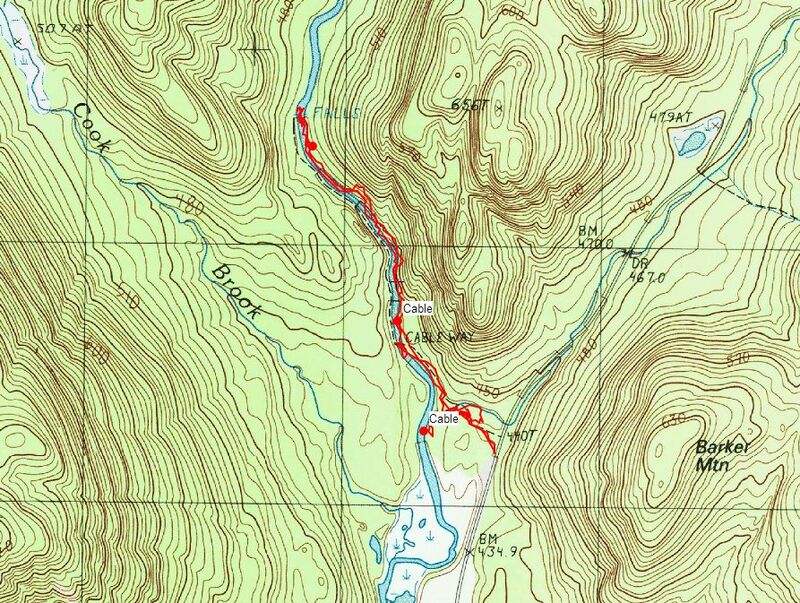 Once you cross the first stream that semi-trail that goes along the stream is not the gorge trail. Look for a few football size rocks that cross that trail and then head UP the hill, that is the trail. Great place to go in the summer for a swim!